Annotation: Six outcasts with dangerous talents and varying loyalties get together to pull off one impossible heist. Can they do it? Plot Summary: Thief, convict, and lieutenant of one of the street gangs in Ketterdam, a bustling international port of trade – Kaz Brekker has never met a challenge he could resist. So when he is contacted and contracted for a seemingly impossible job with giant rewards, Kaz could not say no. The mission: rescue a prisoner from one of the most secure prisons in the world. To complete it, Kaz cannot pull this off alone. He needs to assemble a team, one that consists of a thief, a convict, a sharpshooter, a spy, a runaway and a Grisha Heartrender – a ragtag multiethnic group of individuals with special talents from a variety of different backgrounds and loyalties. Can they complete their mission or will they end up killing each other? Critical Evaluation: For fans of Bardugo’s Grisha trilogy, she takes us back into that fantastical world for a heist story. However, one does not need to read those books to understand this one. Bardugo does a great job describing and building the world as the plot unfurls – Ketterdam with the bustling ports and the watery underworld brings to mind a blend of Amsterdam and Venice and the cold, white Ice Court prision where they have to steal a person. The addition of a world map and a map of the Ice Court helps visual readers grasp the world. Though, what really shines is the tight plotting and the fully fleshed out characters. With six characters and multiple points of view, it would have been to easy for a character to slip into stock representations, but not in this novel. Engaging, dynamic, and relatable characters that seem to leap of the page, even Wylan who does not have his own point of view chapters yet. Chapters are clearly label by character so it’s never confusing to the reader. Lively pacing and lots of action keep the pages turning with a nail bitting ending that will have readers heavily anticipating the sequel. 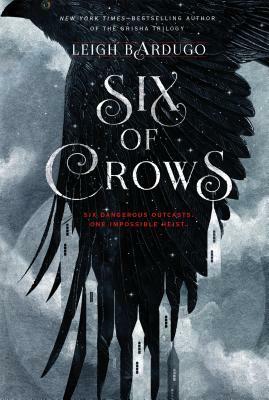 Challenge Issues: Just recently published, Six of Crows has just hit the New York Time’s Bestseller List at #1, reviewed positively by NPR, School Library Journal, and numerous other review sources in the industry, as well as dominated many YA blogs. Bardugo is also author of the popular Grisha trilogy and has an established fan base. Teens also are reacting positively, including this glowing review from a 15 year old.